December 15, 2018 March 27, 2019 - by BiharJobPortal - 20 Comments. Patliputra University PG Admission Counselling 2018 Date and List has published. The students who are selected for counselling can download the Patliputra University PG CET Admission Counselling List – Date Wise and Subject Rank Wise. Download Link is given below. 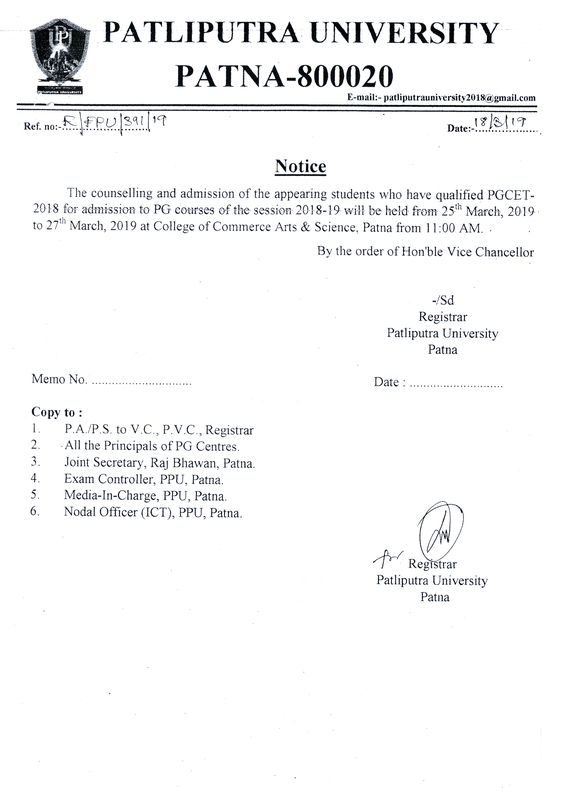 Latest Update (21.12.2018) – PG CET 2018 counselling for Appearing Student open till 27th March 2019. 2019 at College of Commerce Arts & Science, Patna from 11:00 AM. Official Notice Link is given below in the Important Link Section. Student applied online form for Patliputra University PG Admission in November and Exam Conducted on 22 December 2018. The result for Patliputra University PG CET has published on 14th Dec 2018. Now Counselling Date And list has published. Candidate have to bring the following documents for verification during counselling. Place for Counselling: Patliputra University Campus, Opposite Rajendra Nagar Terminal, Patna-800020. Download Subject Wise rank Result List and Counselling Schedule Notice. (Link is given). Check Your Subject Wise Rank and Find out the date. Venue for Counselling: Patliputra University Campus, Opposite Rajendra Nagar Terminal, Patna-800020. Sir , I am appearing student . Sir final year ka marksheet nhi hai.kyu ki AVI xam Magadh University ka turant hua h.kya mera admission nhi hoga???? Sir what is admission fee? Download Prospectus..and According to Subject.. The Counselling Date is over. Officially Patliputra University contact and email se contact karke confirm puche.. I will do PG of music. when time admission in patliputra university. Counselling date khtm ho gya mera list me naam h . Admission ho skta h.
Chance kam but University ke official contact no and email se contact krke confirm karo.. Contact to Patliputra University Campus..